7 year/s ago 1291 Visit WebsiteFoodBroken link? 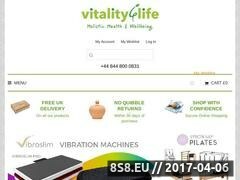 Vitality4life have a wide selection of kitchen appliances and accessories including power mill blender, food dehydrator, soymilk maker, lexen healthy sprouter, manual wheatgrass, vegetable juicers and more. Sorry, BrowseInter.net Website Directory does not contain yet any other websites related to small kitchen appliance, kitchen appliances or kitchen accessories!